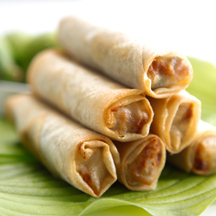 Nuoc Cham, the quintessential Vietnamese dipping sauce, is the traditional accompaniment to Spring Kitchen’s authentic spring rolls. In a small bowl, combine garlic, lime juice, water, and sugar until sugar has dissolved. Add fish sauce and chiles. Cover with plastic wrap and chill until ready to use. Crispy Vietnamese spring rolls are traditionally served as a meal with vermicelli noodles. Wrapped with fresh green leaf lettuce and herbs, the light and crispy texture of Spring Kitchen spring rolls make a healthy meal traditionally served family style. Bring a large pot of water to boil over high heat. Add vermicelli to boiling water and cook just until tender, approximately 4-6 minutes. Drain and rinse under cold water. Allow vermicelli to drain well, tossing occasionally. Transfer vermicelli to a serving platter. On a separate serving platter, arrange lettuce and herbs. Cook Spring Kitchen spring rolls per cooking instructions. Serve immediately on a large platter. 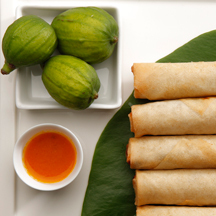 Allow guests to wrap their own crispy spring rolls with sprinkled herbs inside large lettuce leaves and dipped in Nuoc Cham (Vietnamese Dipping Sauce). Serve vermicelli noodles family style with side lettuce, herbs and quintessential Nuoc Cham (Vietnamese Dipping Sauce) — recipe above. Combining the crispy crunch of Spring Kitchen spring rolls with a mixture of fresh green lettuce, mint, Thai basil, cucumber, carrots, and vermicelli noodles will surely satisfy your craving for a delicious and healthy Vietnamese salad. Nuoc Cham (Vietnamese Dipping sauce) — recipe above. Bring a large pot of water to boil over high heat. Reduce to medium heat. Add vermicelli to boiling water and cook just until tender, approximately 5–7 minutes. Drain and rinse under cold water. Allow vermicelli to drain well, tossing occasionally. Cook Spring Kitchen spring rolls per cooking instructions. Cut into 1” pieces. Arrange equal portions of lettuce, mint, Thai basil, cilantro, and cucumber in separate large serving bowls. Arrange equal portions of noodles on top of greens. Arrange carrots on top of noodles. Arrange cut spring rolls on top of carrots. Serve with Nuoc Cham (Vietnamese Dipping Sauce) on the side.